Myths, tall stories, tales of adventure: no shortage of them when it comes to Team 10. But fact and fiction are pulled apart in the recently issued book ‘Team 10, 1953-81, In Search of a Utopia of the Present’, on the new website Team10-Online, and in the major exhibition now on show at the NAi. At the exhibition opening Aaron Betsky told that he was recently in New York at a gathering of multinational CEOs, top policy makers, and top designers like Rem Koolhaas. The last-mentioned happened to refer to Team 10 and, to Betsky's amazement, a number of the attending architects didn't know who or what Team 10 was. The question is whether they'll be any wiser after a visit to the exhibition. Naturally it's difficult to show something that didn't exist in the formal sense, or to convey something like group dynamics. Many attempts are made, but many questions remain unanswered for those who don't belong to Team Max. For instance, to start with the most simple questions, who were the core members? When and where were they born? Where did they study? Where did they work? While the publication focuses on the meetings – perhaps the essence of Team 10 – the exhibition limits its coverage of them to just five small cabinets. (And two of them concern meetings that, strictly speaking, weren't Team 10 gatherings: Otterlo '59 and Triennale '68.) The scanty information on the gatherings need not necessarily be a drawback. After all, emphasising themes in the exhibition doesn't have to mean excluding a look at group dynamics. In the section devoted to Mobility, for instance, De Carlo's design of the master plan for Urbino is displayed beside the London Roads study by the Smithsons and the plan by Candilis-Josic-Woods for Frankfurt Römerberg. Yet the accompanying texts say nothing whatsoever about how the proposals were received. And that's a pity, particularly since in the accompanying book Dirk van de Heuvel and Max Risselada state that the gatherings were primarily an opportunity for presenting projects and subsequently discussing them. Such moments were highly productive in shaping ideas and opinions. But those are minor remarks about what is otherwise a fine and commendable project. One note about the exhibition: a little study before entering is advisable. Either that or a second visit might be worth while, and that can only make for a more rewarding experience. The publication too can be bought in advance, but there's also a lot of information at the www.team10online.org website that was launched at the same time. The site features various brief biographies of the members, an overview of meetings, projects and texts, and a series of research papers on Team 10. All that remains is to assess the relevance of Team 10 to the current debate on architecture and urban design. Within the process of modernisation Team 10 searched for concepts and strategies that would reconcile the individual and the collective to each other again. It also studied how local and regional qualities could be integrated in design and how social ideals and design could come together. In a nutshell: how to realise a Utopia of the present. Such issues are still relevant today, or at least they should be relevant today. The beautifully designed exhibition Team 10 – A Utopia of the Present is one big feast of recognition and discovery. The origins of Team 10 are extensively documented. The original grids exhibited at various CIAM congresses of Team 10 members can now be studied from close at hand. (The exhibited grids are included in the book as fold-outs). Also on show is a short absurdist film from 1954 in which Giancarlo De Carlo ridicules technocratic modernism. That alone merits a visit to the exhibition, but there is much, much more. All around are sketches, photos, drawings, books, letters, notes, and models of projects presented by the members at different meetings. 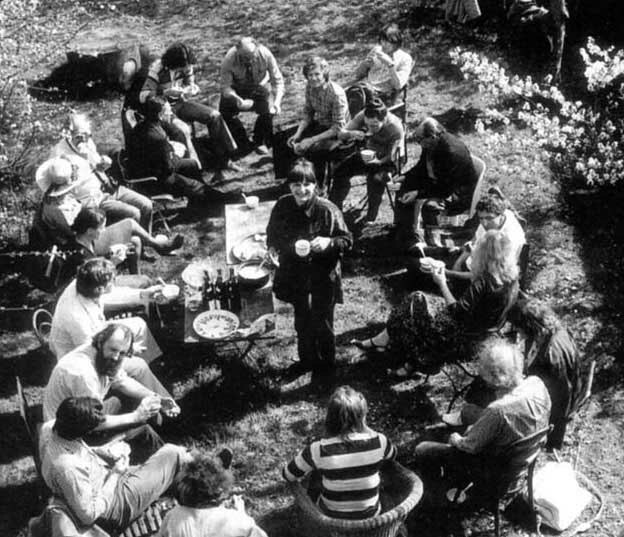 Film footage includes a documentary about Hauptstadt Berlin by the Smithsons, and the TV programme Van Stoel tot Stad ('From Chair to City') presented by Jaap Bakema in 1962, and there are sound recordings of, amongst others, the last CIAM gathering in Otterloo. The meetings themselves are the subject of displays in cabinets. One cabinet features images of the 1968 Triennale in Milan. 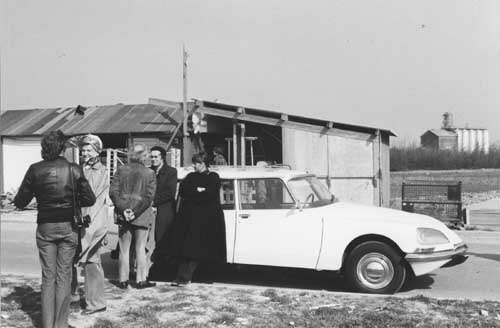 Although not officially a Team 10 gathering, curator Giancarlo De Carlo invited contributions from Aldo van Eyck, Peter and Alison Smithson, and Shadrach Woods. A notable detail is that students and artists occupied the exhibition gallery during the opening in protest against the institutional role of the Triennale. In addition to the exhibition, the splendid publication is another must. True, there are other books devoted to the various Team 10 members, but not much is known about Team 10 as a group, apart of course from what the members themselves published. Team 10, 1953-81, In Search of a Utopia of the Present is the first work to draw connections between the work of the different architects. The three-part book begins with a chronological survey of the post-war CIAM gatherings and the later Team 10 meetings. Each meeting is outlined in brief and comes complete with extensive documentation about the projects presented. Periodicals that had close ties with Team 10 figures – think of Forum and Architectural Design – are also discussed. The book convincingly conveys the group dynamics and the tension between intellectual discourse and professional practice. The essays in part two provide the context for Team 10, deal with Team 10 and its concern for 'the everyday', and examine Team 10 and its relation to modernity. The final section, 'Voices of Team 10', features interviews with former Team 10 members about the meetings and interaction among group members. The book is lavishly illustrated with 'snapshots from family albums' (photos taken by the participants during meetings and excursions) and the full texts of letters. Projects are documented with sketches, drawings, photos and, importantly, the texts are written in clear language. 'Team 10 grew out of criticism within CIAM, as an irritating grain in an oyster', said Aldo van Eyck in 1991. Criticism was directed against what critics saw as the extreme functionalism of Le Corbusier, whom Team 10 members believed wanted to create 'a humane, poetic, disciplined, machine environment for a machine society (probably a society of technicians with a pretty strict hierarchy)' . Team 10 was an informal organisation – there was no such thing as official membership – made up of architects that met regularly. At these meetings, dedicated to topics as mass housing construction, urban infrastructure and the welfare state, participants -'members' and invitees – presented their designs and then discussed them. 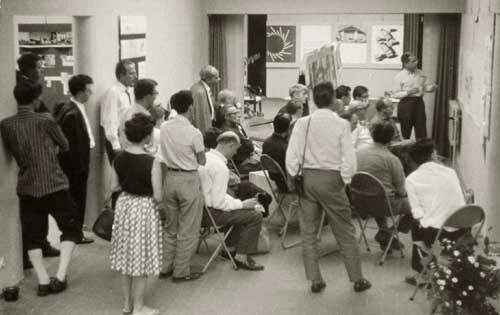 The exchange of ideas wasn't confined to meetings, however, since most members were active in architectural education. As a result, new generations of architects were introduced to the ideas of Team 10. Team 10 had its own 'inner circle' of highly active designers who organised the meetings. These are the figures – Jaap Bakema, George Chandilis, Giancarlo De Carlo, Aldo van Eyck, Alison and Peter Smithison, and Shadrach Woods – focused on in both the exhibition and book, although other members like John Voelcker and Ralph Erskine aren't excluded. Though the group was never officially established, 1953 is considered the year it came into being. That was the year that all core members, apart from De Carlo, attended the ninth CIAM congress in Aix en Provence (France) along with 3000 other people. And it was also the year that a number of them were asked to organise the tenth CIAM congress (hence the name Team 10). That tenth congress took place in 1956 in Dubrovnik. Three years later, in 1959, CIAM was unofficially disbanded during a meeting in Otterlo, thanks largely to the efforts of Team 10 members. After that the Team 10 meetings started, and they were staged over the next eighteen years. Yet most members felt that Team 10 only ceased with the death of Jaap Bakema in 1981. Or as Alison Smithson put it: 'Bakema was […] like Marshal Tito, I mean after him Yugoslavia disintegrated'. Years of research into Team 10 have been carried out by 'Team Max', as Christine Boyer affectionately called it at the exhibition opening. A study that started with the appointment of Alison Smithson as successor to Bakema at Delft University of Technology. She was responsible for the publication of the book Team 10 meetings 1953-1984. Research then continued under Max Risselada. Research into the individual Team 10 members, conducted independently at various universities, formed the basis for the portrayal of the Team 10 group as presented today.